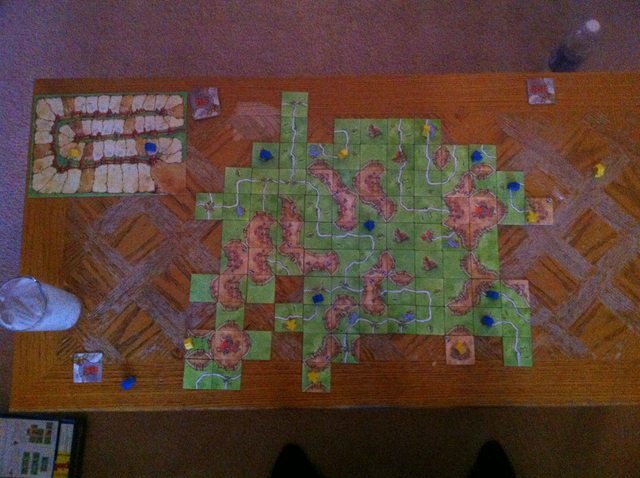 My friend Jeffrey invited me over to play a game of Carcassonne on Superbowl Sunday. He recently bought I&C and T&B on my suggestion. His family is enjoying I&C very much, so he hasn't opened T&B yet for fear of them not wanting to play anymore. He's waiting until they get bored, and then he'll introduce T&B to them. Jeffrey is one of those unfortunate people who bought Carcassonne towards the end of Rio Grande's publishing contract, so he doesn't have the River expansion. I just noticed that my feet are in the picture. That is an awesome game report Scott. It looks like a good game too - and Carcassonne can be like that - played almost casually while watching a football game, for example. One thing that is driving me nuts about your picture though - and it's not your feet. Is that a drink on the table? Haha - that is a big no-no on our table. We've had a couple of bad experiences because accidents dooo happen. I made sure to put it somewhere that I wouldn't hit it by accident. Going to do it again for Superbowl 2015?